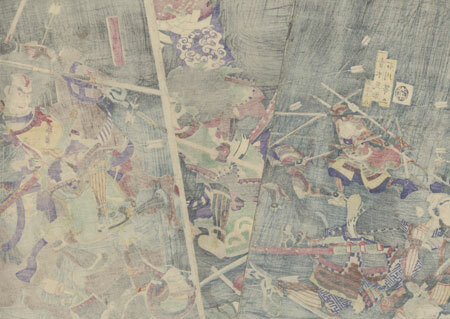 Comments - Fantastic triptych depicting the Battle of Shizugamine in 1583, where Hideyoshi defeated Shibata Katsuie. 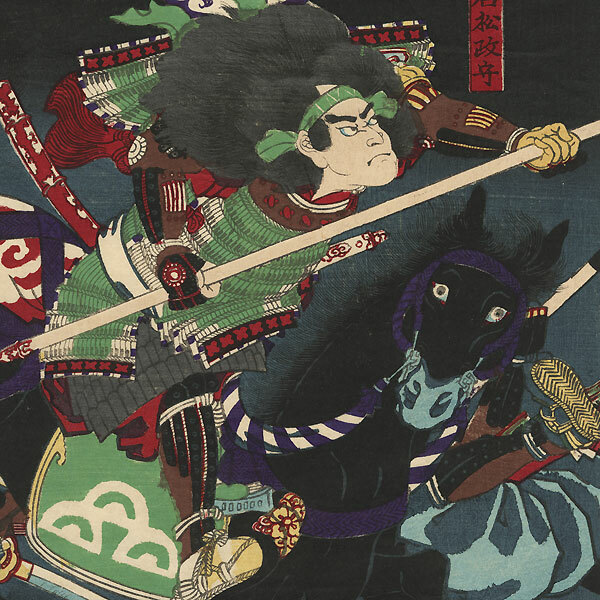 In the center, a young warrior on a black horse charges ahead thrusting his spear forward, a determined scowl on his face. His long hair flows wildly around his face, and his personal standard is topped with a horned demon's head with a red wig. At right, his enemy counters the attack with his own spear, gripping it between both hands as he shouts with rage, grimacing angrily. He is bleeding from wounds to the head and the upper chest, and his pole arm is covered with bloody fingerprints. His horse rears, ready to trample a fallen samurai below, who sprawls on the ground atop abandoned weapons and broken arrows. At far left, two men engage in hand-to-hand combat, one pinning his foe to the ground as he raises his sword, his enemy struggling to use his own dirk. An incredible action-filled scene, with terrific detail in the expressive faces and armor, and beautiful fresh color. A great choice for a samurai enthusiast. Condition - This print with excellent color and detail as shown. Three separate panels. A few small holes, small thinning spot, repaired. Slight toning and edges, a few creases. Please see photos for details. Good overall.